In 2008 I was editor in chief of a print photo magazine that went under. I still wanted to stick with photo editorial, so in 2009 I started my own online publication, pictorymag.com, where anyone could submit a photo to a theme like “Overseas and Overwhelmed.” I curated down the submissions to the most relevant photo stories and then edited both the photos and captions. I also frequently had top creatives guest design or guest edit showcases. When I started Pictory, there was a sophisticated understanding of human needs, desires, and attention span in magazine craft that the web hadn't caught up to. Naturally, in the age of cost-per-million, attention to detail goes by the wayside. Print-style typography on the Web, careful line editing and proofing, attentive and highly practical design, pacing, and narrative arc are things that simply aren’t rewarded on the Web. What the Slow Food movement was to eating I wanted to be to surfing the web. Slow Content. I was rewarded with about 100,000 unique visitors a month — not bad for a solo project in 2009. Part of my passion for Pictory was to enact my vision for online advertising: To have large, magazine-style, high quality advertisements inline with content. Ideally to be a showcase for the most beautiful ads on the web. I was able to strike partnerships and eventually sponsorship with folks like NPR, Etsy, and Levi's — but remember, this was almost a decade ago. Pre-iPad! Overall, I was just a few years too early for the boom in "story ads" and "native advertising" that we see now. I don't remotely regret the project. The things I learned about life through reading people's stories day after day will stick with me always. 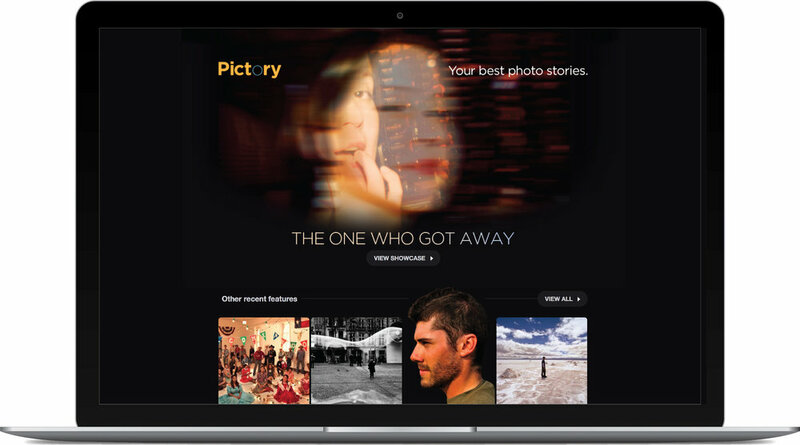 I'm so grateful to everyone who submitted a story to Pictory, as well as the talented folks who donated their time to guest editing or designing. Some of the stories are sad; others are humorous; others exalt the ordinary. All of them celebrate the photograph. The sheer concentration of creative effort per post is impressive in its own right, but Pictory’s ultimate success lies in the emotional resonance of its photographs and the stories that go with them. I’ve mentioned Pictory before - a new online photo magazine that pulls together elements of the Big Picture and JPG into short narratives. The latest installment, entitled The One Who Got Away, is beautiful. Secrets of Inspiring Women. A breathtaking photo series. Recently they’ve introduced branded content into the showcases, which creates a seamless blend of editorial and advertising that I think will be adopted by many other publications. What works best are clean, uncluttered, wide-format layouts. A good example: Pictory magazine, whose launch predates the iPad but which seems ideally suited for the device. 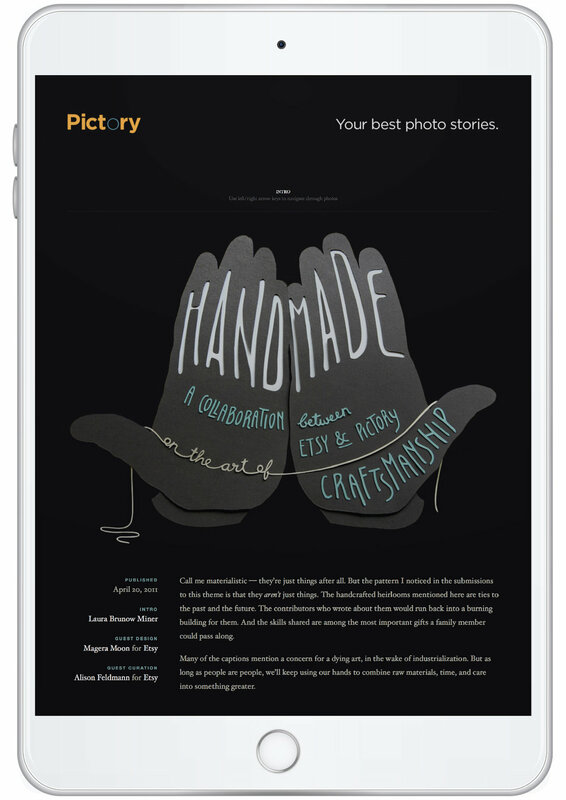 Pictory magazine takes something incredibly simple — a photo and a caption — and makes it art. Like the radio show “This American Life,” each issue has a theme — and with a good theme, a single large-format photo and caption really become a story. It’s called Pictory, and it’s wonderful. … Like, award-winning good. Like, being in a museum good. It’s a simple idea with great execution. Pictory’s gigantic images and sumptuous design are a photographer’s dream — and a web surfer’s eye candy. Next, read about an electric bike festival I helped brand.